Top players such as Berry Plastics, Dow Chemicals, and Fuji Seal International, Inc., are leading in the global stretch and shrink films market, as per Transparency Market Research (TMR). The top players are increasing their operation in a number of emerging economies and are targeting on tie-ups with the local distributors for strengthening their foothold in the global stretch and shrink film market. Amongst other companies, Bemis Company Inc. is targeting on the geographical expansion and has adopted this as a top development strategy. On the basis of revenue, the global stretch and shrink film market stood at US$14.1 bn in 2015 and is predicted to touch US$21.1 bn by 2024, expanding at a 5.20% CAGR from 2016 to 2024 On the basis of type of material, the segment of linear low density polyethylene (LLDPE) held a dominant share in the market in 2015 and is predicted to constitute a share of approximately 47% by 2016 end, on the basis of revenue. On the basis of product, the market is dominated by the segment of shrink films. In terms of end use, the sector of food and beverages holds the most significant share on the basis of revenue in this market. On the other hand, the pharmaceutical sector is predicted to exhibit the greatest growth rate during the forecast period. 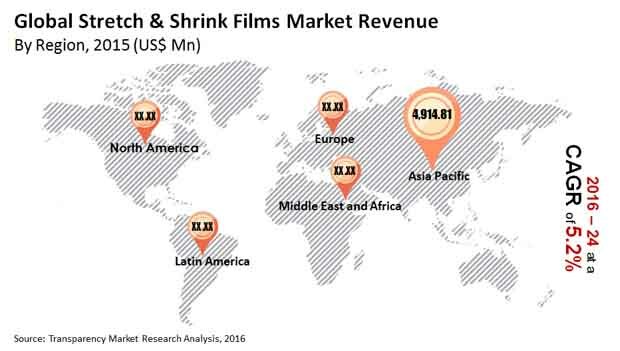 On the basis of geography, the region of Asia Pacific emerged as the key revenue generator in the global stretch and shrink film market. This region is also predicted to be the most swiftly developing region all through the forecast period. This is owing to the fact that this region is experiencing a rise in investments within the manufacturing sector and the disposable income of consumers is on the rise in this region. On the other hand, Europe is predicted to experience a slow development during the forecast period. Nevertheless, both France and Germany are predicted to play a lead part in the overall sale of stretch and shrink films within this region. The proliferation of organized retail outlets within this region is a prime factor providing impetus to the sales of stretch and shrink films in this region. The increasing demand from the logistics and transportation industry, the consistent development of the retail industry, and the increasing expansion in the pharmaceutical sector are the prime factors positively impacting the global stretch and shrink film market. “The increasing development of the packaged food and beverages industry will also fuel the development of the overall stretch and shrink films market,” says a TMR analyst. Furthermore, the growing sale of retail products and the increasing e-commerce sales are expected to bode well for the growth of the market. On the other hand, the increasing concerns regarding the health and safety of individuals and on the damaging impacts posed on environment have resulted in the introduction of strict government rules and legislations. These rules and regulations may negatively impact the development of the global stretch and shrink film market. Furthermore, small companies making stretch and shrink films are facing difficultly in switching from non-biodegradable materials. This factor is also poised to work against the growth of the market, states a TMR analyst. Nonetheless, stretch films are being highly employed in the packaging of numerous palletized consumer goods such as toys, electrical and electronic gadgets, compact discs, and gift packs. This has emerged as a key opportunity in the global stretch and shrink film market.